We are proud to say we successfully completed our west coast tour this year! We enjoyed performing to very attentive crowds from San Francisco up to Seattle. We mellowed out in Eugene, and visited our hipster roots in Portland. Olympia was also a wonderful experience hosted by Olympia Jazz Central. We’ve already begun planning for our 2015 endeavors and will certainly keep you all posted on our future plans. Using the glorious technology of smart phones along with the satirical wit evolved from many weeks spent in a van, we created a follow up video to Tunnel Mountain! This year features The Wagon and the Gun, the first track off our second album Alive. The skies of the Oregon Coast may be grey and gloomy, but the future of Tunnel Six is bright and prosperous! Keep updated with our facebook page! Tunnel Six is very proud to be on our 5th tour since our original conception back in 2009! This year we are indulging in the west coast of the United States. We started off with an educational clinic and concert at the Bay School of San Fransisco. We find just as much enjoyment in our educational contributions to young jazz students as we do putting on our own performances. 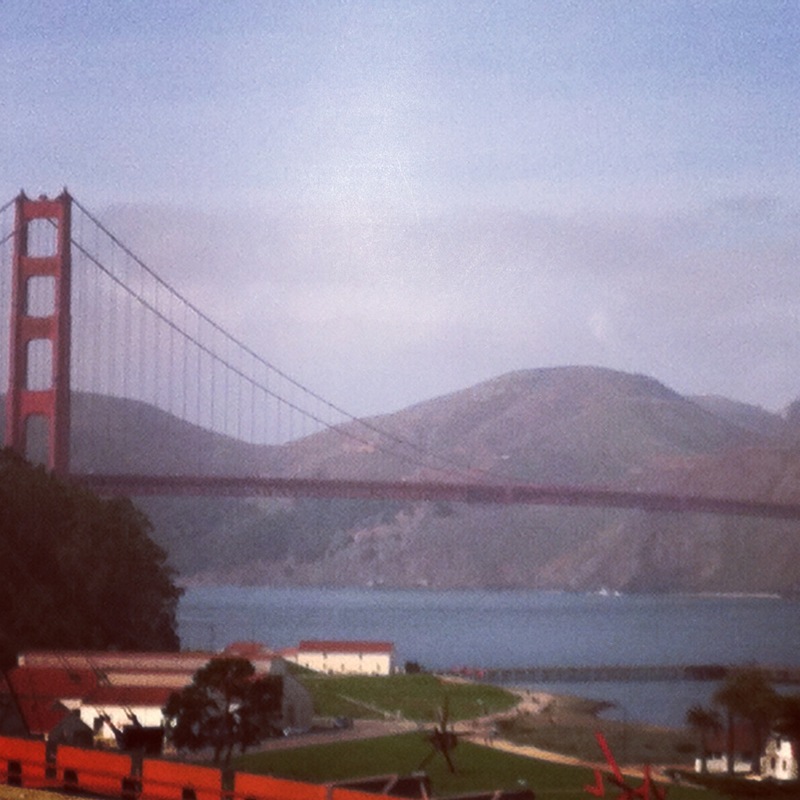 After a hop skip and a jump across the Golden Gate Bridge we were off to Eugene to play at the Jazz Station. After a very late night drive, we arrived in Portland early Saturday morning. With very little sleep, we began incorporating new material for this year during an afternoon rehearsal. That night we played at the Secret Society to a very enthusiastic “portlandia” crowd. Sunday has been a day to relax… which in true Tunnel Six fashion means rehearsing for six hours! We are now enjoying the great coffee and foods Portland has to offer. Tomorrow we head off to Olympia were we will be playing The Royal Lounge. As always we are very thankful to our loyal supporters! Thank You! This entry was tagged concert at the Bay School of San Fransisco, educational clinic. Bookmark the permalink. On Saturday night Tunnel Six had an extremely pleasant experience with The Edmonton Jazz Society at The Yardbird Suite. The venue was great and we marvelled in the extremely impressive list of performers who have graced that stage! It seems to be a tradition to sign your name on the wall of the green room backstage. This was our 3rd time performing there so we were very grateful and honored to have written our name on the wall along side such talent. This photo consists of just a few names, the list simply went on forever and the picture app only allowed for 9 tiles. Afterward, Tunnel Six shuffled westward to the very beautiful British Columbia! We enjoyed a nice evening at Jericho Beach overlooking Vancouver’s epic skyline then jumped a ferry over to the island where we performed for The Georgia Strait Jazz Society in Courtenay. Both of these gigs were incredible for us for many reasons. They were held by two of Canada’s functioning jazz societies which meant that the audiences were not just full, but attentive and appreciative of the art. As well, when organizations such as these provide their members with such a high caliber of consistent programing, it fosters a culture of trust within their community that facilitates the discovery of new and visiting artists. We are very thankful to these organizations for truly making a tangible and effective effort to support the arts and contribute to the progression of this timeless music! Here is a picture including members of T6 with some of the leaders of these great jazz societies. Today we arrived in Victoria and are looking forward to performing at yet another staple of Canadian jazz tradition, Hermann’s Jazz club on Tuesday night! After that we will be playing at The Cellar in Vancouver on Wednesday night! Lastly, as the title promised… here are some goats on the roof of a market… only on Vancouver island could we see this!! After spending a few days in Canmore Alberta, Tunnel Six is charging forward toward the glamorous Yardbird Suite in Edmonton! We are proud to return to this venue after our last visit in 2011. We’ve been spending most of our time rehearsing new material, revisiting old favorites and squeezing in some time to enjoy the stunning western Canadian landscape. On Wednesday we arrived in Calgary and enjoyed an evening at one of our favorite local restaurants Tapas. The food was great! Also keeping in tradition, this photo includes an adorable little puppy that spent some time with us while waiting to pick up our oversize baggage at the airport. T6 is happy to report that his owner did arrive to pick him up safely. As well, you can’t visit Alberta without including some photo of a bear… this one happened to be laying next to one of our beds… quite a sight to wake up next to! Thursday night was an enjoyable night at Wine Oh’s in Calgary. Lastly, here are some mountain goats we encountered roadside in the Banff National Park. We have successfully arrived in Brandon Manitoba! While it may be a little chilly, and yes, we’ve even acquired a little snow on our boots, we’re happy to be launching our 2013 tour. This year we are supporting the release of our second full length album: Alive. Last night we played our first gig at The Music Studio in Brandon Manitoba. It was a great to return to this venue since our very first tour back in 2010. The building offers a unique “old city” feel because it was originally a Bank. Even the vintage vault remains and has since been turned a practice room. Many friends came out to show their support since both brothers Ben (saxophone) and Jesse Dietschi (bass) are proud Brandon University alumni. After rehearsing new material all afternoon, we are relaxing tonight as we prepare to host a clinic at the Waverly Park Public School tomorrow evening. Tuesday we head off to Winnipeg to play the Centre Culturel Franco-Manitobian that evening! We’re thrilled to release our second album “Alive,” recorded on tour last year. It’s available digitally from our Bandcamp page and physical copies will ship out by the end of next week. Recorded during our Summer 2012 tour, ALIVE features all new material with the same group aesthetic and strong sense of dynamic interplay. The band sound has matured, and we feel that things really came together for this project. From the intertwining horn lines on ‘The Wagon and The Gun’ to the intricacies of the rhythm section in ‘Up Hill’ and the pensive ballad ‘Columbia,’ ALIVE showcases the band in top form. Have a listen, and mark your calendars for the upcoming tour April 27-May 11 – full details at the Performances page! Well we made it! Tunnel Six has officially wrapped up our 2012 Spring tour. We performed in nearly a dozen cities across Canada and the US and recorded enough material to release a live record. We are all back in our respective home towns now (Ben and Brian in Toronto, Tyson in New York, Chad in Seattle, Ron in Halifax and Andrew in Portland). While we are glad to be home, we felt it was an incredibly successful tour. These tours are an artistically amazing and educational experience for us individually and as a group. This year the music was pushed creatively in both writing and improvisation, while our main goal of achieving a unified ‘group’ sound was developed to be more cohesive and distinct than ever before. We will be spending the next few months sifting through our increasing catalogue of material looking to find the best takes for the ‘Live’ album. Be sure to check out our blog every so often as we will be posting ‘teasers’ of our new music and updating you on what we are each doing in our individual careers. THANK YOU VERY MUCH for your continued support of our music! Thank you to the Canada Council For The Arts for their generous support! It is because of their funding that we are able to exist as a cross continental ‘indie jazz’ band. We are very proud to introduce our music to both Canadian and American audiences from east to west thus strengthening the artistic community between these two incredible, and historically artistic, countries. Well the Tunnel Six crew has made it to Portland, Oregon! We’re delighted that the weather is so nice out here, can you believe it, no rain on the west coast! Wednesday night we performed at Tula’s jazz club back in Seattle to an eager audience. It was the second of our (now four) recording dates for this tour. Afterwards we enjoyed ‘happy hour’ at a near by sushi place which basically meant we all eat two to three portions of sushi each. We spent our time in Seattle at Chad’s beautifully renovated home, we even got to participate in some of the work as we helped him install his new steel bar, connecting his kitchen to his dining room. With a quick drive to Portland Thursday morning we were off to play at Jimmy Mak’s. This time, and for the only time on this tour, we had an opening band! The Blue Cranes set the stage with their emotionally charged, introspective music. We were all floored with their stage presence and sophisticated taste in improvisation. And of course along with our own ethos there were beautiful soaring melodies to keep it all together. We got up and played our long set to a packed house. It felt great to play to both Andrew and Tyson’s home town. Today we’re off to play at the Lincoln City Cultural Centre. In the meantime we’re enjoying the west coast’s famous coffee. We performed at The Cellar jazz club last night in Vancouver. The place was packed which helped make it a great show. It was the first concert of a series of three in which we are being recorded for a possible full length “live” album. While the show had a good vibe for our delightful audience, as a band we are continuing to push each other artistically to achieve the sound that we imagine to be our second album. So we’ll be sure to spend another full day rehearsing to tighten up the loose ends for our next few gigs. After the concert Tunnel Six had a good chance to unwind and enjoy the city of Vancouver. There may have been some tequila shots, some pints and a lot of good times had…. we’re not sure as we are still picking up the pieces today. Our friends Ian and Jackie were kind enough to look after the band for the night. Which meant for some of us we were woken early by an adorable puppy licking our faces, not a bad way to wake up. We then consolidated our enormous amount of equipment into Andrew’s ‘little engine that could’ and headed off. Ben, Chad, Ron and Andrew stuffed into his truck while Tyson and Brian jumped a train heading towards Chad’s hometown Seattle, which is becoming one of our favourite cities to visit. We will be performing at Tula’s on wednesday night. Here is the view from the train. Tunnel Six will to continue the tour with our recording sessions in Vancouver, Seatle and Portland. We sincerely apologize to any dissapointed fans in the area. Friday we were graced by a delightfully full crowd at the Beat Niq jazz club in Calgary. The atmosphere in the club was mellow and content; most likely because the Beat Niq is one of the last remaining ‘true’ jazz clubs left in Calgary. It’s always such a treat for us musicians to know that people do come to listen to the music! The next day we headed off to Penticton in the Okanagan Valley in BC. Again, Tunnel Six found itself surrounded by beautiful mountainanous landscapes. In the evening we played a quaint resaturant and bakery called Opus Cafe. We slowly gained the attention of the audience as we embarked on a slow burn of T6 epicness over the course of two sets. We’re happy to say we had them tapping their feet and rotating their chairs to get a better view by the end. Here’s a little sample of a “The Wagon and the Gun” by Brian Seligman, one of the nine songs we intend to record.